Moderator, I think you need to read a little more. I have a VQ35DE, and many others like me. re-mounted my scavenging pumps to accommodate it's lines/oil return lines didnt know exactly how to mount this but did a little welding to my fab'd up radiator arms and I think it worked out well. 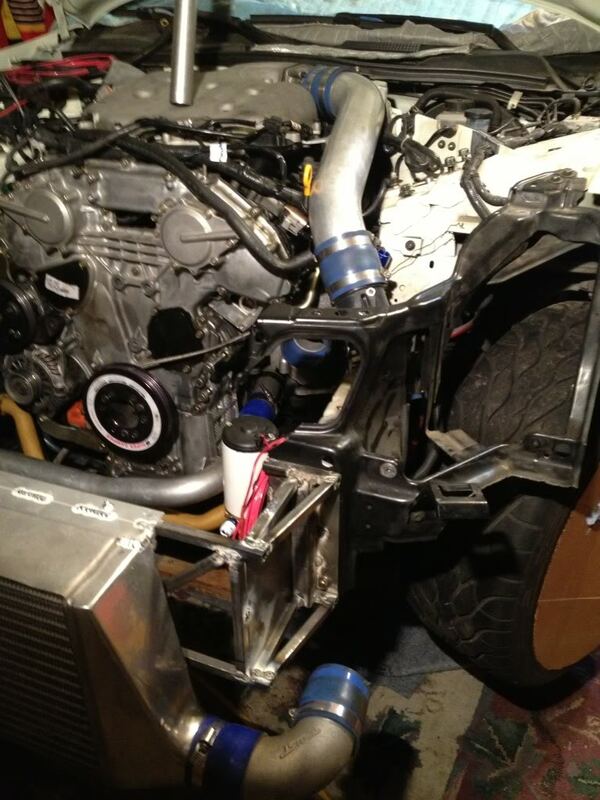 Getting the turbo jackets tomorrow and I can wrap up the driver side bank. Lastly, oil cooler #2 came back from 3R, some simple welding so I can attach a bracket…I believe I have enough SB hose to where I can mount this below the driver's side headlight…I need a few more AN fittings, but I can pick those up along the way. Not sure if anyone answered this already but think of it this way. Heat obviously always moves from hot things to cold things through some process of heat transfer. So you are either dumping the heat from the engine into either the fluid in the engine and radiator or you are dumping that heat to the air flowing around the engine. The coefficient of thermal conductivity of air is roughly .024 where as the coefficient of thermal conductivity of water is roughly .58 and the coefficient of thermal conductivity for engine oil is roughly .15 (depending on you coolant and oil). Point being you are better off dumping heat through these mediums than through plain air. Also lowering intake air temps lowers the likelyhood of engine destroying knock at otherwise identical conditions. This is why when you tough some mtals they feel colder than the air around you. The metals are transfering (stealing) your bodies heat at a faster rate than the air because of their higher thermal conductivity. So you are either dumping the heat from the engine into either the fluid in the engine and radiator or you are dumping that heat to the air flowing around the engine. great analysis - thank you for taking the time…I couldnt agree with you more on transferring heat energy to coolant and oil as a primary method. Whats the harm in having passive air flow move through the engine compartment evacuating heated air? Also lowering intake air temps lowers the likelyhood of engine destroying knock at otherwise identical conditions. It'll be a lower-tier task but I would like to extend the duct between the compressor and air-filter…push it towards the front of the car where it can gather cooler air…I'll have a better idea of what I can do once the radiator and IC are in their final positions. Last edited by bealljk; 05-20-2013 at 04:20 PM. there isn't really any harm, so far as I can tell (maybe some lift or drag effects but that's hard to say for sure without CFD), so long as that air is not flowing through the engine bay at the expense of the volume of air flowing through the intercooler, radiator, and oil cooler. air will follow through the path of least resistance. some of the air flows through the radiator, IC and oil cooler and some already goes to the engine bay. the engine bay is already the path of least resistance because it doesn't have to be crammed through a radiator. if you open the bumper up enough you increase this path of least resistance and allow more and more air to bypass the radiator and go to the engine bay, effectively reducing the air flow through radiator,IC, etc. 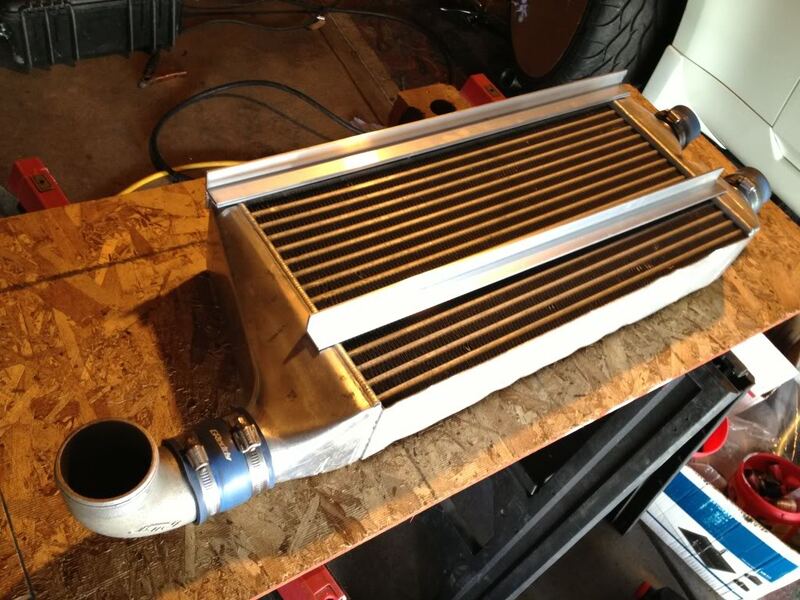 if you can enlarge the inlet and the funnel the air through the intercooler and radiator you will see greater benefits than allowing that air to cool the motor externally. you can visualize it by saying you have a crowd of 30 people trying to get to the top of a building. they can either take 5 flights of stairs or take an elevator that only holds on person. the elevator is easier but it can only take 1 person, so most people, rather than waiting around for the elevator will take the stairs.if you increase the crowd to 35 but increase the elevator capacity to 10 people per trip, although you increased the crowd size, ultimately fewer people will use the stairs. funneling the air as I said earlier would be like increasing the crowd size but putting a out of order sign on the elevator. while you might see some reduction in air temperature going into the turbo I don't imagine much more that a few degrees. the real issue though is when the air gets to the turbo because when air is compressed it heats up. 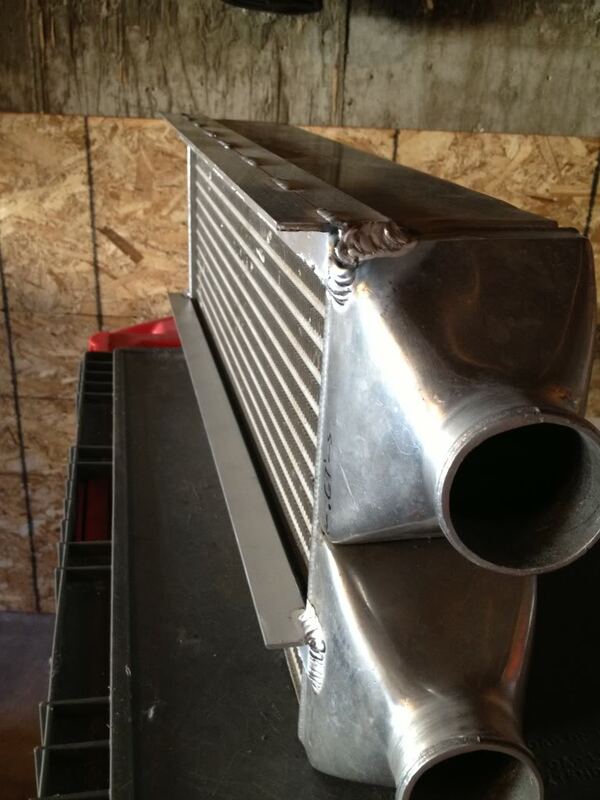 The intercooler is much more effective at reducing temperatures and it cools the air after it has been compressed. 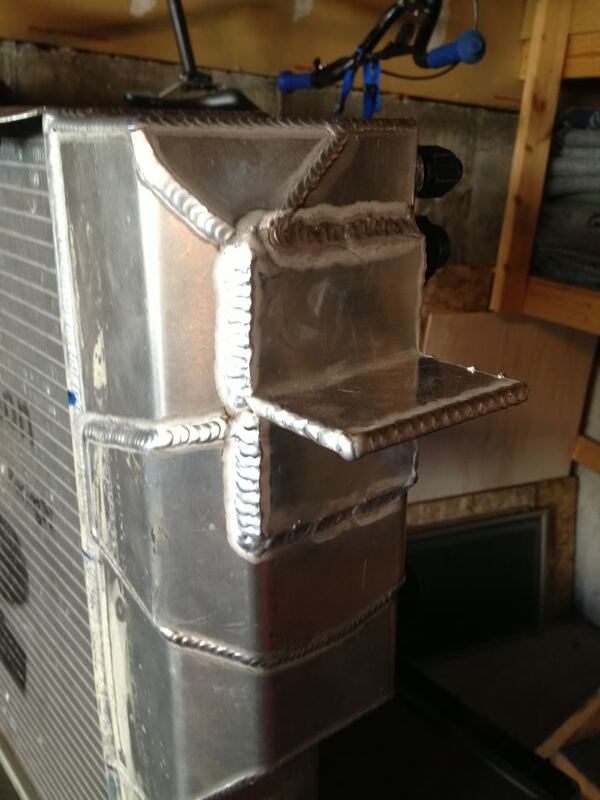 ultimately what this means is that while moving the piping out slightly will probably reduce the temperature a small bit, the intercooler is a much more effective tool for shedding heat from the intake charge. Last edited by nathanwl2004; 05-21-2013 at 07:59 PM. 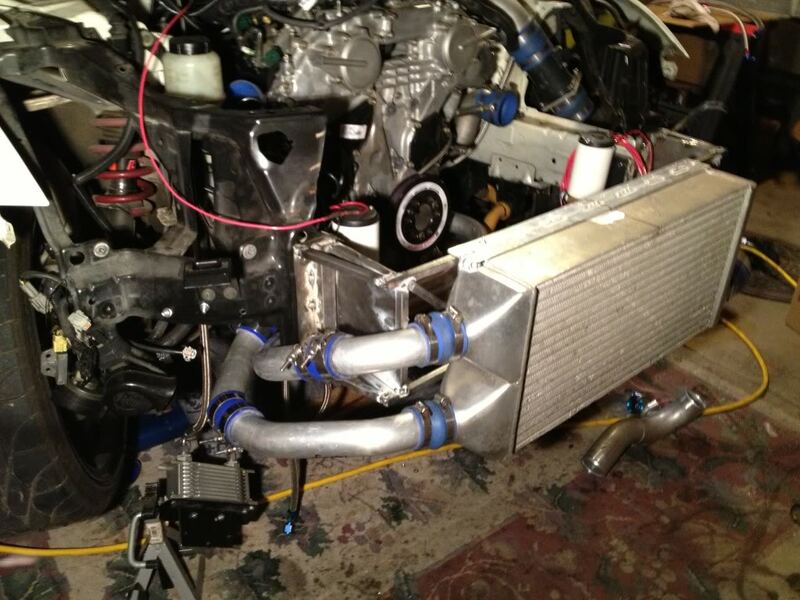 ultimately what this means is that while moving the piping out slightly will probably reduce the temperature a small bit, the intercooler is a much more effective tool for shedding heat from the intake charge. in any event, I'll be interested to see how it turns out. how much boost do you plan to push? my plan from the couch I sit on right now is to get everything built and reviewed by someone that knows more than I do. I currently have a tune in the haltech that should hold 12psi…which should be good enough for me to get to a shop where I can get a better interim tune…my final tune will come in August - the local nissan forum is flying in the Specialty Z guys to tune. 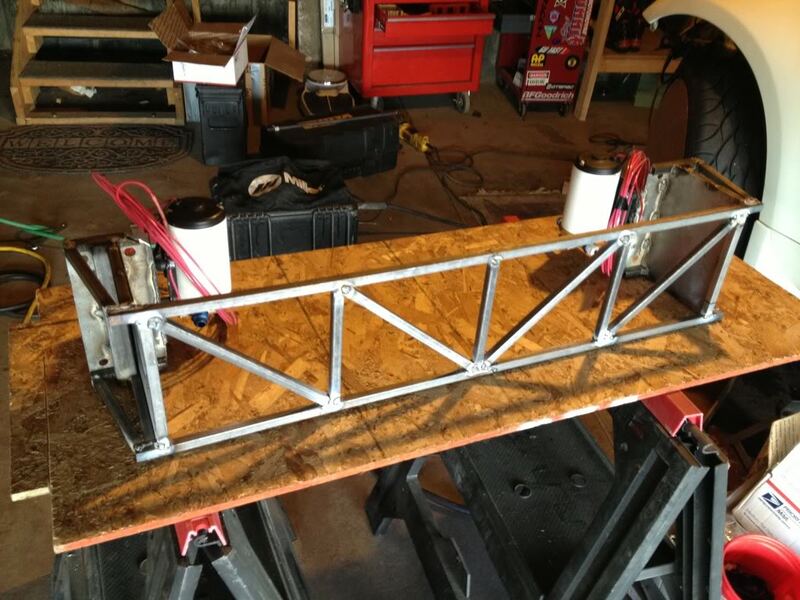 back on it…duct work is in but I am not 100% sure where I'm going. 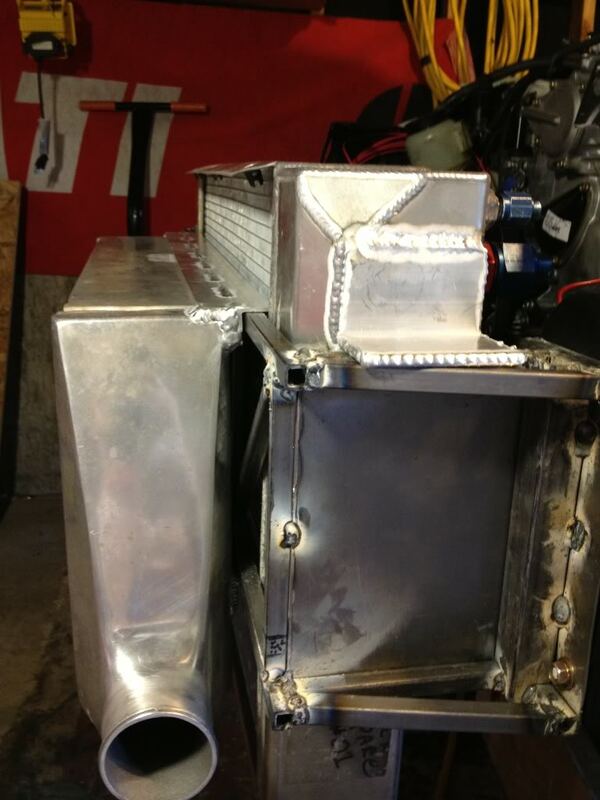 Finished fab'ing up the front bracket to hold the intercooler and the radiator. 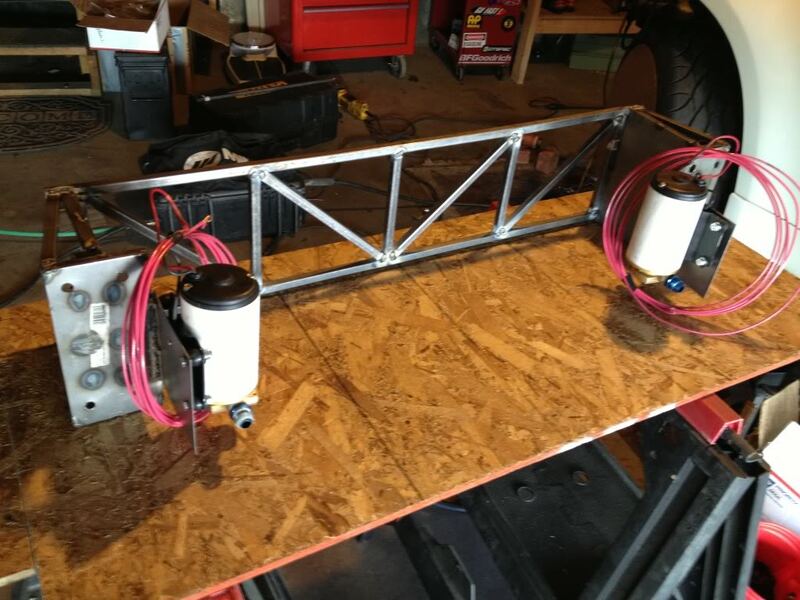 I will have the angles welded onto the intercooler and radiator - intercooler as pictured will mount to the front of the bracket via angle that will bolt into the bracket - both top and bottom. 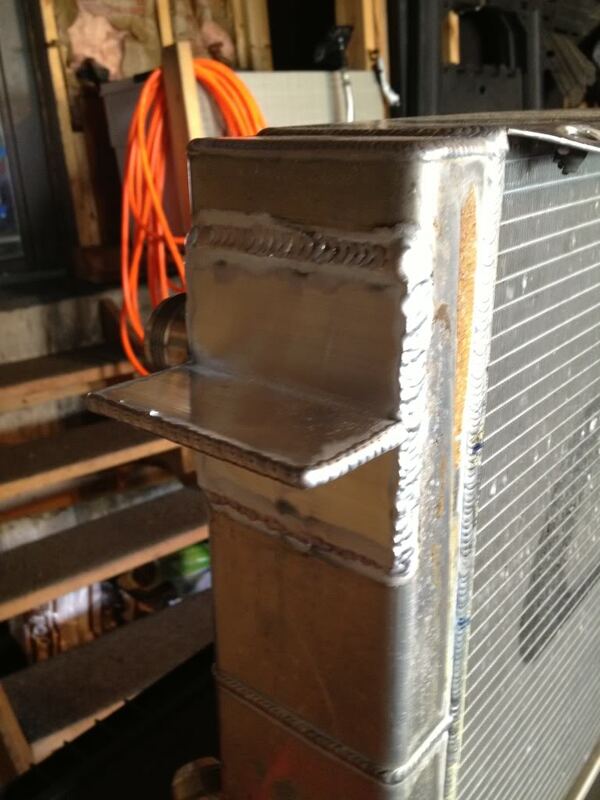 The radiator wil have similar angles welded to the sides. The radiator will drop in from above and only bolt in on the top. Once these are in I will have a better idea of my final duct work. After that last picture, I need a Samuel Adam! Looks like fun, and I'm sure gonna run like a beast! I need a Samuel Adam! I had to disconnect the power steering cooler and, although I drained it, it leaked all over the place and that box(which had my PS pump in it) was the closest thing I could grab. 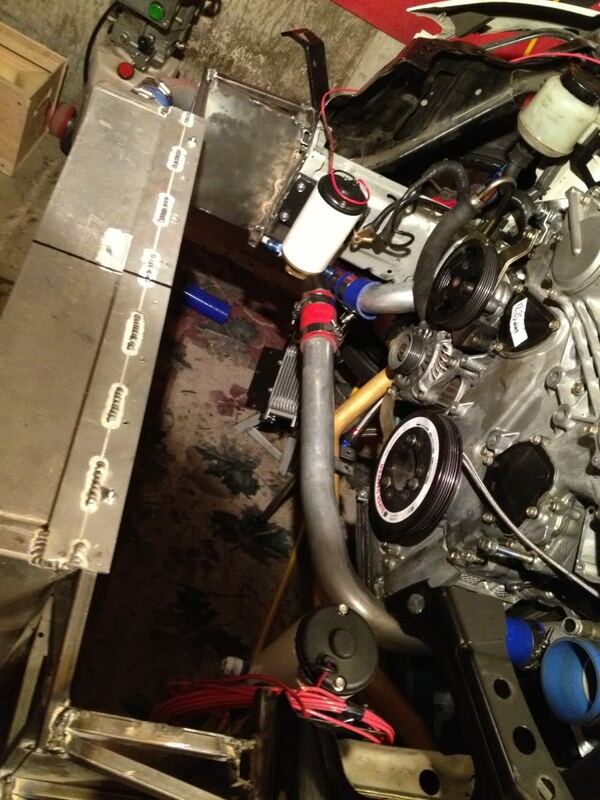 Sending the IC and radiator off tomorrow to get mounting angles welded on. Last edited by bealljk; 06-03-2013 at 08:13 PM. and im subd in for this build. 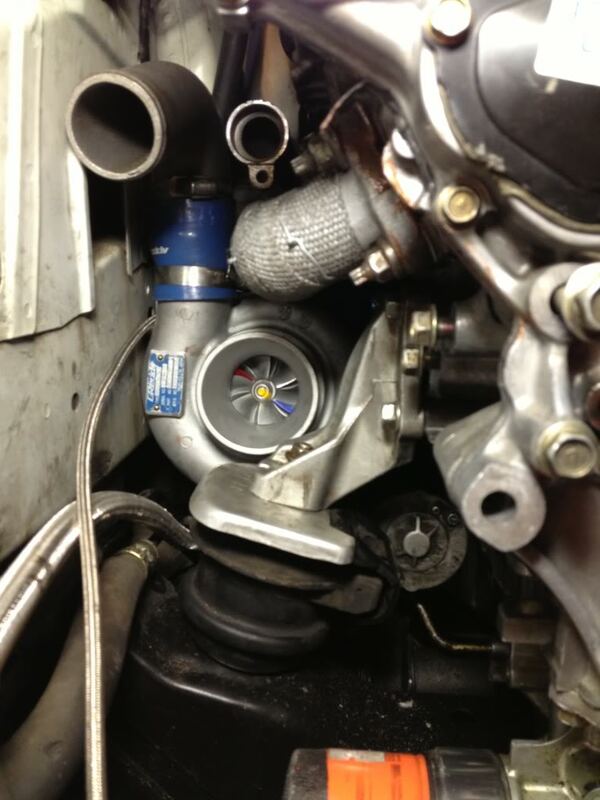 Ive always wanted to put my own turbo setup up in when I can finally afford it. lol. There is just a much greater sense of pride for it and I love working on my car. and I also dont trust a shop after hearing how NismoK's shop experience went. Last edited by 350Z Project X; 06-05-2013 at 06:11 PM. 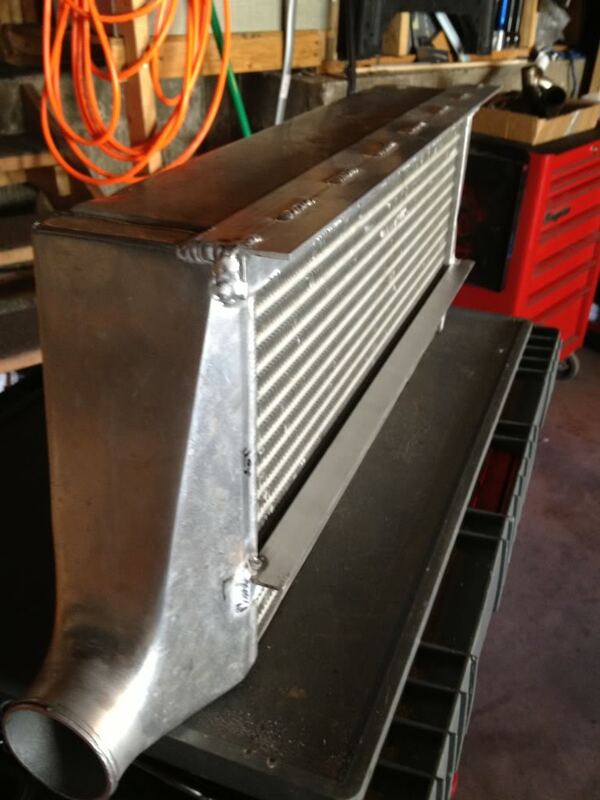 I'll drill out and bolt in the intercooler next…thinking of putting 5 or 6 small nuts & bolts on both the top and bottom of the intercooler and then maybe 3 on each side of the radiator. Last edited by bealljk; 06-11-2013 at 06:52 PM. nothing significant but got the intercooler intake all plumbed up…not exactly happy with how many couplers I have but I had to do a semi-custom plumbing job due to the location of the IC. 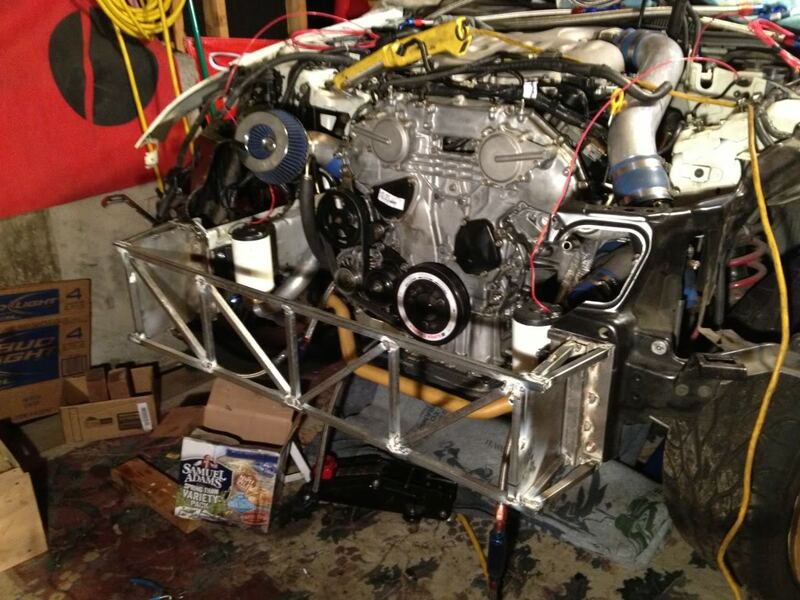 The only thing I can think is to have it welding exactly where it needs to be after I get the car running. this piece was hacked up for my supercharger install back in 2006 so if it ***** the bed I will find a salvaged replacement bracket and try again. 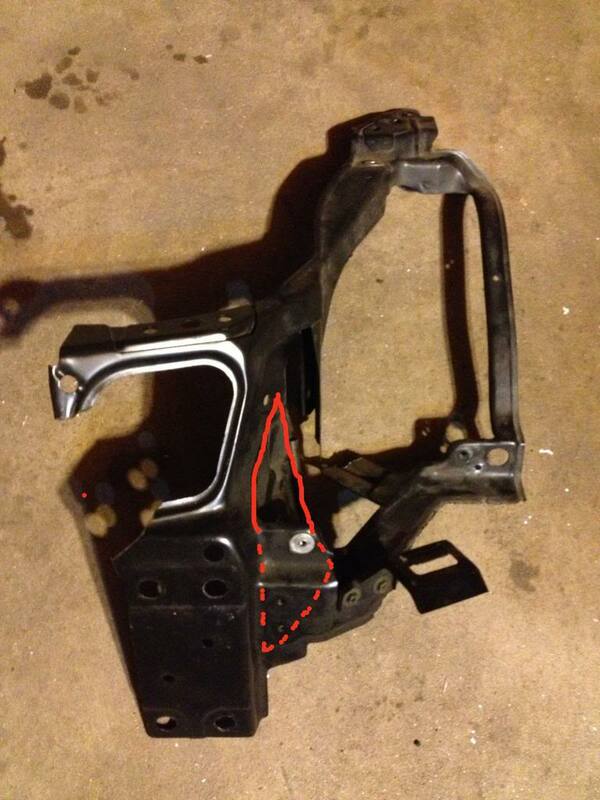 why not just cut a hole in the sheet metal on the bracket and route thru there?